Although Roksan is one of the fixtures in the Brit‑fi firmament, there has been some realignment of late. Last year, practically without warning, the last of the two original founders of the company sold Roksan Audio to loudspeaker company Monitor Audio. The reason behind the sale was understandable on both counts; Monitor Audio wanted an established electronics brand to partner its speakers and, after more than 30 years, the founder wanted a break. This ultimately caused a cross-country factory move and some changes in distribution, but the Roksan product line remains unchanged. This poses a slight problem for Hi-Fi+, because most of the Roksan product line is already well-covered. However, the latest Radius 7 and its matching Nima unipivot tonearm have yet to receive a review, and the Corus Silver moving magnet cartridge has never had an airing (we did look at the Roksan Corus, but back in issue 24). As they make a perfect partnership, we felt it was time to check them out, especially as there is a limited edition version with a built-in charitable donation that is worth describing. The most obvious change in the Radius is its extensive use of glass-coloured acrylic in the chassis and subchassis. This gives the Radius 7 a greenish hue, but Roksan happened upon a pink-tinged variant that delivered the same goods as the standard acrylic. To extend the pink motif further, the normally neutral-coloured Nima arm also sports a pink armtube. The colour scheme is not just style led, as a percentage of the proceeds of the Radius 7 Pink goes to Breast Cancer Care. Having lost my own mother to metastatic breast cancer in 2005, this is a charitable venture I can relate to. Charitable donation to Breast Cancer Care notwithstanding, the demographic profile of the audio enthusiast world is so heavily weighted toward middle-aged men, that I can’t help wondering just how successful a pink turntable might be, especially in a world still so dominated by black, silver, and wood veneers – it’s like the last 30 years of interior design just passed us by. In fact, the deck looks remarkably good, both in standard finish and in pink. In fact, I’d argue that it looks slightly better in pink, because the green tones can look a bit ‘zombie apocalypse’ in the wrong light. If your deck sits under the wrong light, snap up a pink Radius fast. OK, no more colour scheme talk. The Radius itself is an improvement over the Radius 5, largely thanks to a better motor power supply (which also now includes a speed control switch, instead of having to swap belt positions on the motor spindle), and better deck-to-motor decoupling. 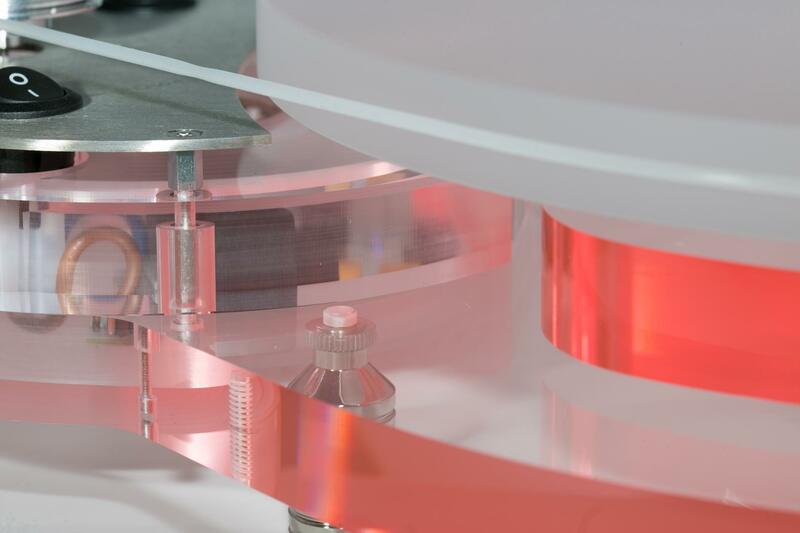 Like most Roksan designs, the turntable is built up of separate layers (we’ll use the terms ‘chassis’ and ‘subchassis’ for convention sakes, but ‘motor layer’ and ‘bearing layer’ are probably more accurate). Viewed from the top, the two layers look like eccentric cams, centred around the bearing itself. The two layers are joined together with decoupling standoffs, and there is no construction required by the user at this stage. Instead, all you need to do is mount the lock-nut feet, dress both the captive power and arm cable, put the opaque acrylic platter on the bearing housing, and attach the white circular belt to the outside of the platter. Once installed, aside from an annual re-lubing of the bearing itself, the turntable is effectively maintenance-free. You need a good light, rigid, and level surface, and you might want to consider a record clamp (consider it, but don’t actually go for it, as in most cases it undermines the sound). Copyright © 2019 Hi-Fi+. All rights reserved.